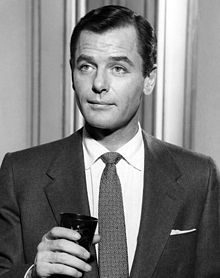 Gig Young (n. 4 noiembrie 1913 – d. 19 octombrie 1978) a fost un actor american de film. A fost căsătorit cu actrița Elizabeth Montgomery. 1950 The Silver Theater Episode: "Lady with Ideas"
1951 Pulitzer Prize Playhouse Episode: "Ned McCobb's Daughter"
The Bigelow Theatre Episode: "Lady with Ideas"
1953 Robert Montgomery Presents Episode: "The Sunday Punch"
Schlitz Playhouse of Stars Episode: "Part of the Game"
1954 Producers' Showcase Simon Gayforth Episode: "Tonight at 8:30", Segment "Shadow Play"
Lux Video Theatre Episode: "Captive City"
1956 The United States Steel Hour Dave Corman Episode: "Sauce for the Goose"
1957 Climax! Edgar Holt Episode: "Jacob and the Angels"
Studio One Philip Adams/Alan Fredericks Episode: "A Dead Ringer"
1958 Goodyear Theatre Herman Worth Episode: "The Spy"
1959 The Twilight Zone Martin Sloan Episode: "Walking Distance"
Shirley Temple's Storybook Miles Hendon Episode: "The Prince and the Pauper"
1962 The Alfred Hitchcock Hour Duke Marsden Episode: "A Piece of the Action"
1963 Kraft Suspense Theatre Hugo Myrich Episode: "The End of the World, Baby"
1976 McCloud Jack Haferman Episode: "The Day New York Turned Blue"
1970 Won They Shoot Horses, Don't They? 1971 BAFTA Award Nominated Best Supporting Actor They Shoot Horses, Don't They? 1971 Kansas City Film Critics Circle Awards Won Best Supporting Actor They Shoot Horses, Don't They?